We finally had a sunny day and spent some time at the park. 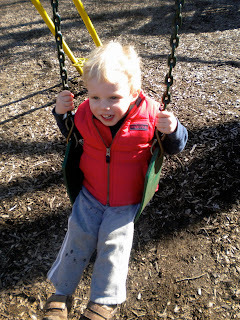 The kids enjoyed the swings, as most of the slides were still wet from the melted snow. After the park, we rode out to the stables to see if the horses had their jackets on, dropped the plastics off at the recycling bin and made a quick trip to the "Pig Store" for some last minute dinner needs. Sure hope tomorrow is sunny, too!